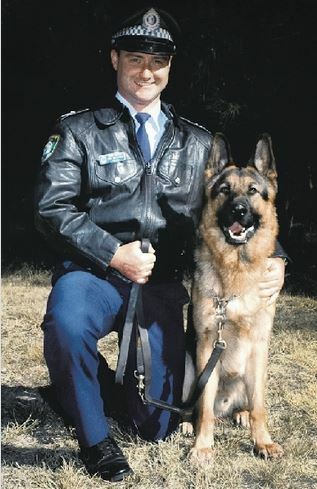 4th NSWPF Dog to be killed ‘ on duty ‘ since formation of the Squad in 1932. Police Dog CARTS & Senior Constable Dave WILLIAMSON. The fourth Police Dog killed ‘ on duty ‘ was Police Dog Carts, who died after being stabbed during a police operation at Corrimal Surf Life Saving Club on December 9 last year. Last Wednesday, 18-year-old Nemanja Vukadinovic, of Balgownie, was sentenced to 18 months’ jail for fatally stabbing Carts. Police Dog CARTS & Senior Constable Dave WILLIAMSON at David Carty Reserve, at the corner of Horsley Drive and Fairfield St, Fairfield. 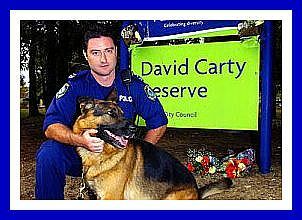 Senior police yesterday paid tribute to veteran Police Dog Carts, who was raised by police and named after murdered officer Constable David Carty. Special stab proof vests were brought in after Police Dog Titan was stabbed to death three years ago but Carts was not wearing one because it was believed the alleged offenders were unarmed. 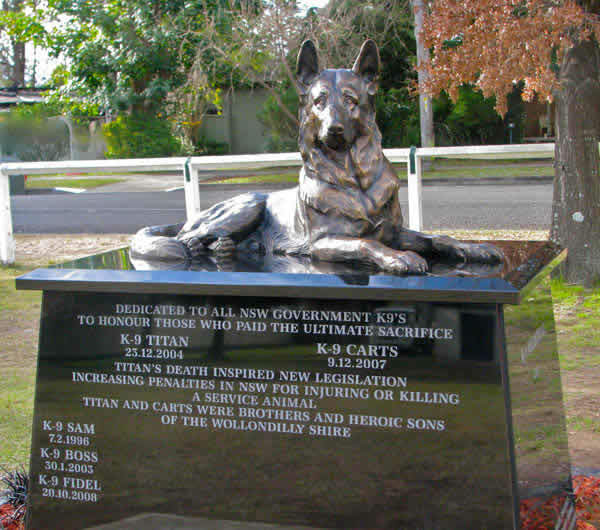 Titan was the first police dog to be stabbed in the line of duty. His killer Luke Graham Curtis was last year sentenced to seven years jail over the killing. Chief Superintendent Wayne Benson said Carts had served NSW Police with honour and in his final act had secured the arrest of an alleged offender. “Without doubt he served with honour, he has performed his task, that was what he was trained for and tragically he has died,” Supt Benson said. He said Carts death also highlighted the terrible loss of Constable Carty who was murdered at Fairfield in 1997. “The death of David Carty still lives on in all our memories and whether it is this incident or any other, it is just the nature of police work,” Supt Benson said. Carts’ first handler Sen-Constable David Williamson last year paid tribute to the special connection between his charge and Constable Carty when he took Carts to a memorial service. Both alleged offenders were charged with aggravated break and enter and take conveyance without consent of owner. Carts‘ alleged killer was also charged with kill or seriously injure animal used for law enforcement and use weapon to resist arrest. He was refused bail and will face court today. 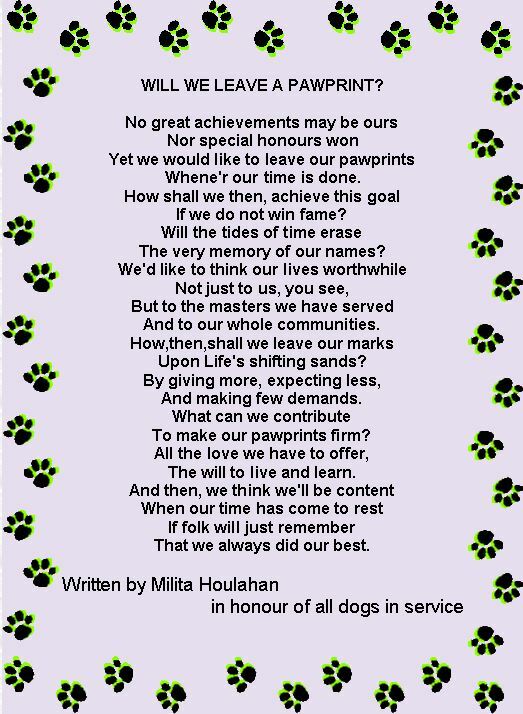 Ode’ to Police Dogs – Will we leave a pawprint ?